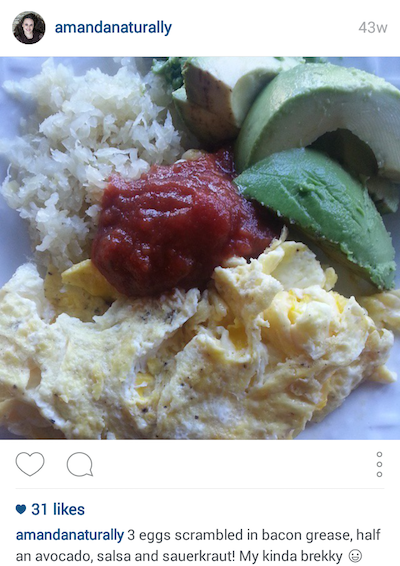 Recently I have had a lot of questions on my Instagram account about sauerkraut. What it is, how I use it, where I find it and why I’m so obsessed with it. 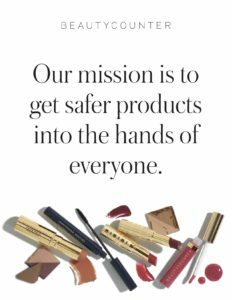 So let’s chat about it! Sauerkraut is fermented cabbage. I know, that doesn’t sound so awesome, but trust me, it’s delicious! To be honest, when I first started eating sauerkraut, I didn’t like it. But I wanted to like it, so I made a conscious decision to work at it. I started with 1 tsp, mixed in with sautéed onions, potatoes and sausage. It was faint, but the flavour was there. Over a few weeks/months I started increasing the amount I was eating. And then one day, I realized I loved the stuff!! I started putting it on everything – hamburgers, tacos, sausages (of course). What’s my favourite food to eat it with? Eggs. How bizarre is that?! Bizarrely delicious, that’s how! If you like it, try it – I promise it’s amazing! Why have I made such a concerted effort to develop a liking for sauerkraut? As I said before, sauerkraut is fermented cabbage. Fermented foods are an incredible addition to your diet. For the longest time I was always focused on what to avoid in my diet – no more dairy, then gluten, then garbage-y gluten-free products, then legumes. That was an important part of my healing process, but it was only when I started actively adding in super foods that I really started seeing some amazing changes. The weakest part of my body is my digestive tract. I feel like it’s always a work in progress. It still flares up from time to time, which is frustrating considering I’m supposed to be coaching others on how to heal themselves, and I’m still working on myself! Whenever I start down that thought path, I try to take a few steps back and imagine where I would be if I hadn’t made the interventions I had when I did. Probably on some serious IBS drugs and en route to a full blown autoimmune condition like arthritis. Lately, I’ve been having digestive attacks less and less, and I swear it coincides with aggressively including fermented foods in my diet on a regular basis. I try not to go more than a day without a fermented food, and it seems to have done wonders for my belly! So what’s the deal with fermented foods?? First and foremost, they are an absolutely incredible source of probiotics. Sauerkraut is made by allowing non-oxygen dependent microorganisms to grow on the cabbage. These microorganisms are powerful probiotics – way more potent and diverse than anything you can get at a health food store! Constantly consuming probiotics (in food form) will slowly start to change the landscape of your colon – in a good way! If pathogenic gut bacteria are starting to grow over (a.k.a. 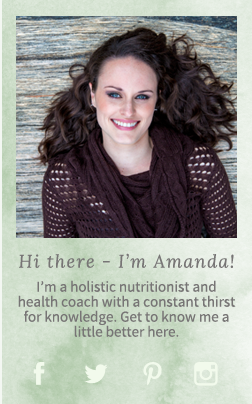 dysbiosis), regularly reintroducing healthy bacteria can keep them in check! Having a healthy gut microbiome is the foundation of a healthy body. 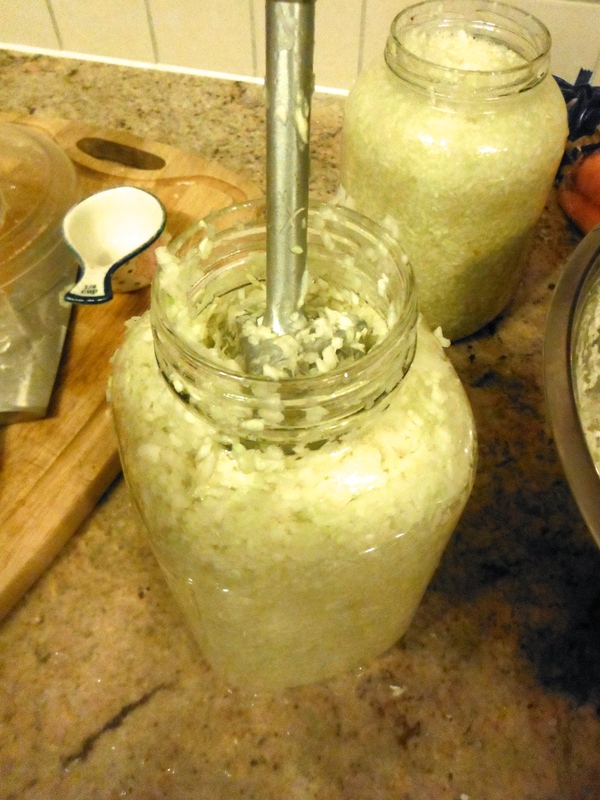 Fermented foods are an easy and inexpensive way to keep your gut healthy! Second – fermentation increases the bioavailability of certain vitamins and enzymes. The cabbage is pre-digested by the microorganisms, which makes it easier for us to digest and absorb the nutrients. Third – it’s an easy and delicious way to get some extra veggies in! If we’ve been out of town and come home to an empty fridge, I know I can grill up some meat from my freezer and add some cabbage for a complete meal! Lastly – it’s empowering. Eating a delicious food (well first learning to find it delicious) on a regular basis, and knowing that it is actively working to heal my digestive tract and support my overall gut health is super amazing. It’s the simplest thing that keeps my digestion healthy, my immune system rockin’ and my nutrition status through the roof! All from eating a little kraut! Super cool. Where to buy the good stuff? First of all, it is absolutely imperative that you eat raw sauerkraut. The standard stuff found at most grocery stores isn’t actually fermented – it’s pickled. Not the same thing! Pickled kraut is found on the shelf. 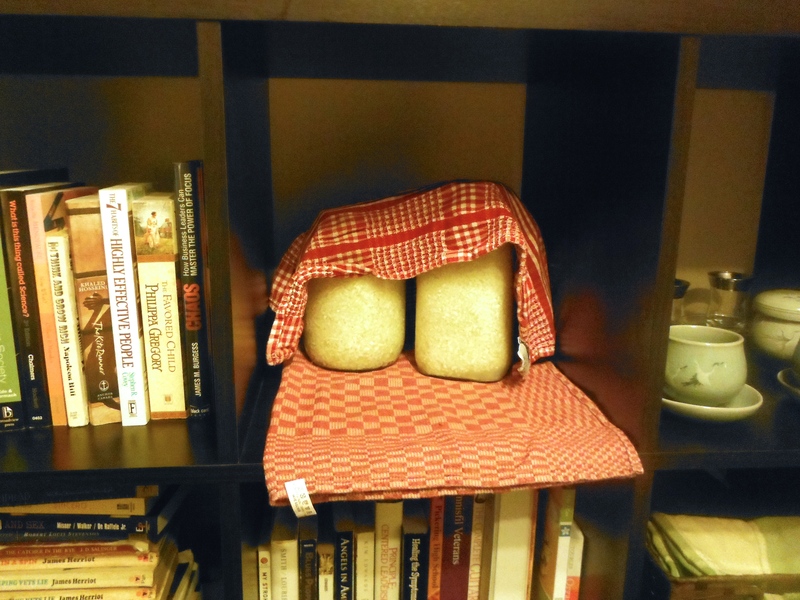 Fermented kraut is always in the fridge. I used to buy my sauerkraut at the farmer’s market, because it was to die for! They added fun herbs such as nettle and dulse, which helped mellow out the sour flavour. Unfortunately as I started to eat more and more of it, $10/jar started to add up quickly. There are some great products at local health food stores that are slightly more reasonable. My 2 favourite brands are Bubbies and Eden Organics. One day I decided to learn how to make it myself. It couldn’t be that hard since practically every culture in human history has some kind of fermented food in their diet. And at $3 for a head of cabbage – I couldn’t beat the price! My first 4 batches of sauerkraut had a 50% success rate. The first batch I followed directions I had found online somewhere. It didn’t recommend keeping an eye on it, so I put it in the back of a closet and left it for 3 weeks. When I went to grab it at the end of its fermentation time, it was a mouldy mess! I hit the internet and realized what had happened. The good bacterial growth needs an anaerobic environment. This means it needs no exposure to oxygen. So it has to stay submerged under water at all times! So, round #2. Total and complete success! I diligently checked the sauerkraut every day and topped up the jars with a salt water solution regularly. I was thrilled! Also, I used purple cabbage, so it was beautiful! Round #3. I got cocky. I had nailed the last batch so I thought it would be a breeze this time round. I even poured the leftover sauerkraut juice on my new batch of kraut to speed the fermentation process. I didn’t check it nearly as often, so what happened? Mouldy mess. Round #4. I perfected my technique. A perfect balance of keeping an eye on it, without being obsessive! This is how I make my sauerkraut. 1. 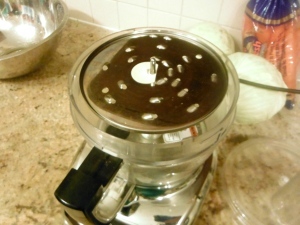 Add your shredder attachment to your food processor. 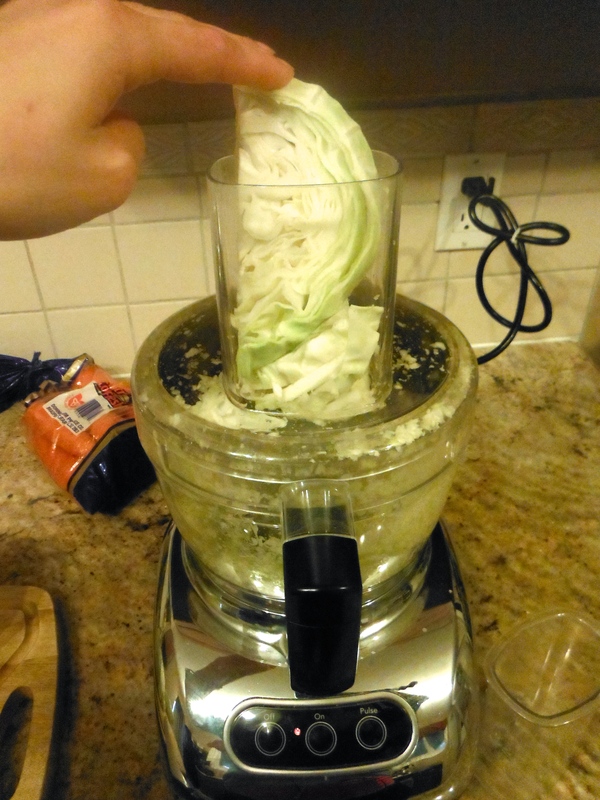 If you don’t have a food processor, you can shred your cabbage using a Spiralizer or a good knife! 2. Peel the outer few layers off your cabbage. 3. Chop the end off your cabbage. You can cut out the core as well, but it’s not necessary! 4. Cut cabbage into slices that will fit into your food processor spout. 6. 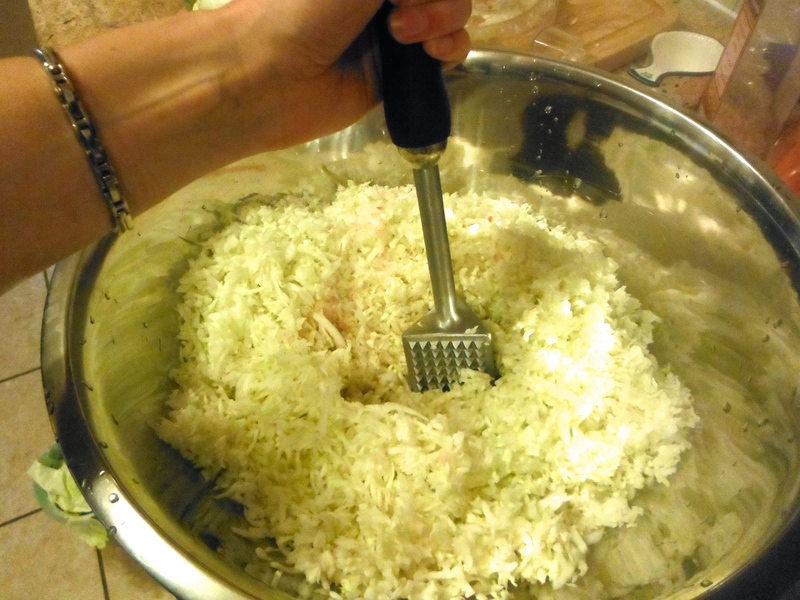 Dump shredded cabbage into a large bowl. Sprinkle liberally with sea salt. 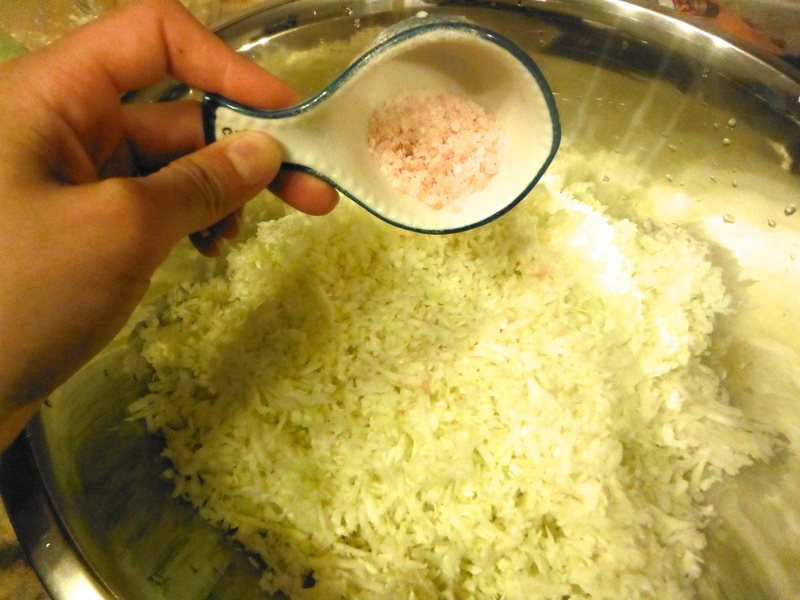 I used about 1 tbsp sea salt per head of cabbage and I usually do 2-3 heads of cabbage at a time. 7. Smash your cabbage with a meat mallet or your hands for a few minutes, until the cabbage starts to soften and releases some of its liquids. 8. 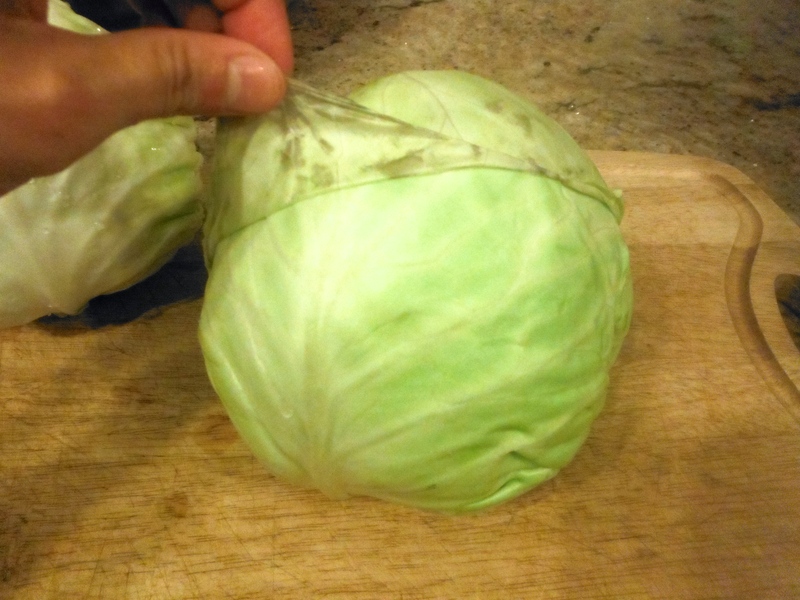 Pack the cabbage as tightly as possible into jars. 9. Sprinkle the top with some additional sea salt (I used a few twists of my salt grinder) and add enough filtered water to make sure the cabbage is all below the surface. A few pieces will float on top, that’s okay! 11. Place your jars in an area of your home where they can sit undisturbed for 3-4 weeks. It needs to be relatively dark (no sun exposure) and a fairly consistent temperature. You also need to be able to access it easily! I keep mine on a shelf in my living room! 12. Cover with a tea towel to prevent dust and bugs from getting in. You might want to place it on a plate, tray or another towel, because sometimes liquid can bubble up and over in the first few days. It can be a little stinky the first few days too – this goes away! 13. Every 2-3 days, check on your sauerkraut. If you notice that the water has dropped below the cabbage, simply add a few more grinds of sea salt and some filtered water. 14. 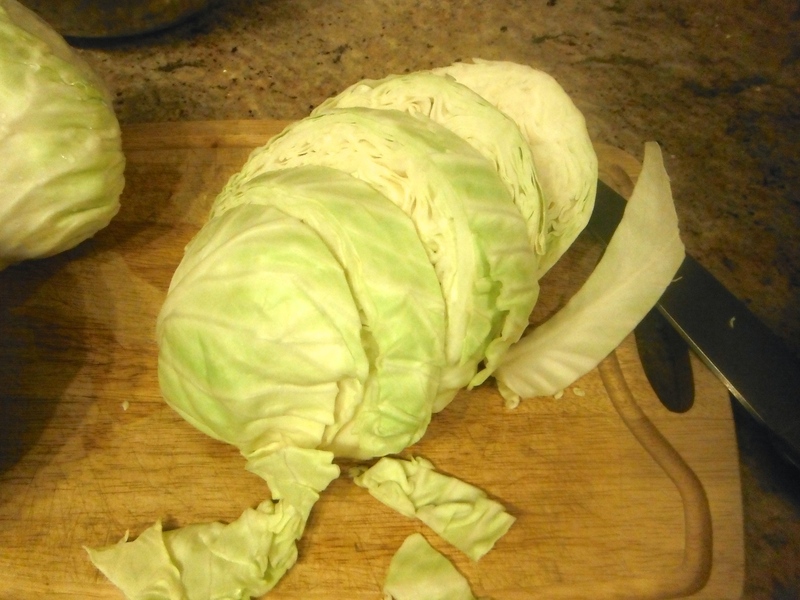 In 3-4 weeks, with the help of some amazing beneficial bacteria, your cabbage will have turned into sauerkraut! At this point you can add the lid and place in the refrigerator for regular use. Enjoy! 1. Please do NOT rinse your sauerkraut after fermenting it! I have had many people say they were worried about the salt content, so they rinsed it off. You will be rinsing away the good bacteria at the same time! Sea salt is not bad for you, in fact it is a fabulous source of minerals. If you are eating real, whole food you actually need to make sure you get enough salt in your diet. 2. Do NOT heat your sauerkraut. It will kill the bacteria. 3. My kraut-making technique has evolved over the last year or so. I now use a fermenting crock because I make extra large batches. You can also use these nifty jar top fermenters. 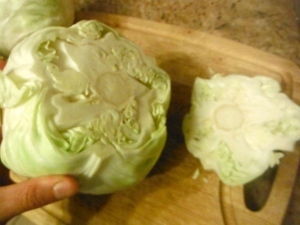 Both are great because they force the cabbage to stay submerged, decreasing risk of mould. 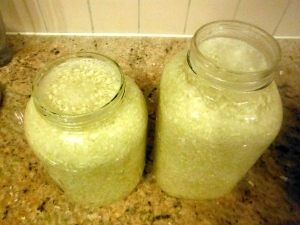 So tell me, have you ever fermented any foods? Do you have any recommendations for other fermentation projects I should try? I am just learning and we started a batch of k rout. As it is fermenting liquid rose to the top and above weights. What do I do next. remove liquid or leave it there? Another relative thought you are supposed to rinse Krout when it is done before canning it… Am at sea. Any information would be helpful. Have never tried this before. Leave the liquid there! The liquid holds all of the amazing beneficial bacteria (aka. probiotics). I actually use leftover liquid from an old batch of sauerkraut (that I’ve finished) to kickstart my next batch of sauerkraut – it speeds up the process. A note about canning sauerkraut: the canning process (any heat actually) will kill the beneficial bacteria. If you are planning on canning the cabbage, you might as well just pickle it and can it right away! If you take the time to ferment it, it’s to get a natural, food-source of probiotics in the diet. 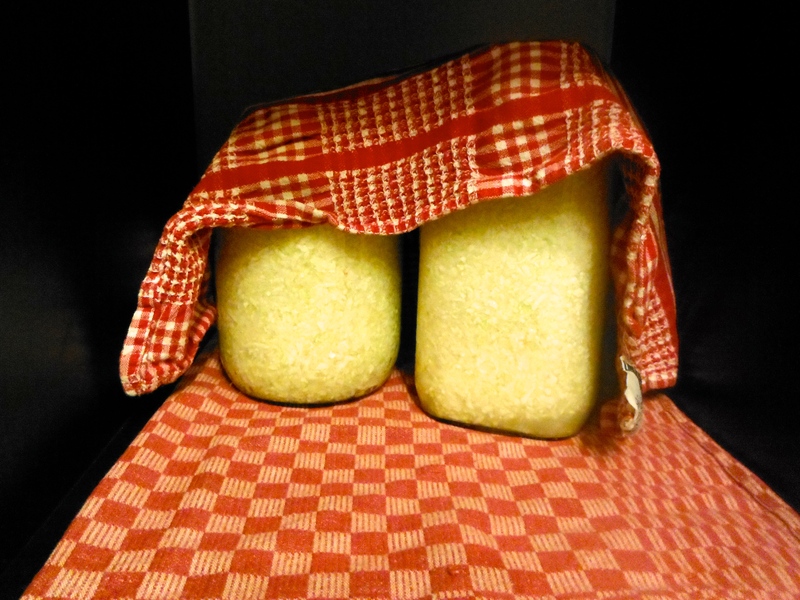 When I’m done fermenting my sauerkraut (about 4 weeks), I put the lid on and store it in the fridge. It won’t go bad, and the bacteria stay alive. I just made my first batch in my new fermenting crock, it has been in it for abut 51/2 weeks, it looks great but doesn’t have too much of a vinegar taste, any thoughts?